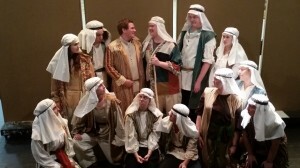 Coe-Brown Northwood Academy Theatre will proudly present the award winning musical Joseph and the Amazing Technicolor Dreamcoat on October 23, 24 and 25, 2014 at 7 pm in the Gerrish Gym on the CBNA campus. With lyrics by Tim Rice and music by Andrew Lloyd Webber, Joseph and the Amazing Technicolor Dreamcoat tells the Biblical saga of Joseph and his coat of many colors which comes to vibrant life in this delightful musical parable. Joseph, his father’s favorite son, is a boy blessed with prophetic dreams. When he is sold into slavery by his jealous brothers and taken to Egypt, Joseph endures a series of adventures in which his spirit and humanity are continually challenged. Set to an engaging cornucopia of musical styles, from country-western and calypso to bubble-gum pop and rock ‘n’ roll, this Old Testament tale emerges both timely and timeless. The title character of Joseph is played by junior Isaac Guzofski, and the Narrators of this great story are played by senior Rachel Dallaire and junior Janais Axelrod. Other cast members bring the tale to life include seniors Olivia Anatone, Hannah Grady, Jordan Roach, Colton Rush, and Alec Schleich; juniors Jessica Cooper, Claire Hammond, Damian May, Jared Neal, Emily Therrien, and Ryan Wadleigh; sophomores Cassandra Barnhart, Sierra Brady, Lauren Burrows, William Girard, Joseph Guptill, and Arianna Jones; and freshmen Zachary Helm, Nina Laramee, Kayla Pollak, and Allison Rose. The production is directed by faculty member Elizabeth Lent with musical direction by David Deardorff and choreography by Kolby Hume. Reserved tickets are $8 for adults and $6 for students and seniors, and are available by calling 942-5531, ext. 237, by email elent@coebrown.org or at the main office before or after school. This dazzling and entertaining performance is one you don’t want to miss.